Our almost 3 year old had a tonsillectomy and adenoidectomy two days ago. She was not allowed to eat or drink anything after midnight. She didn’t eat much dinner, but I gave her a HUGE bowl of ice cream for dessert. We didn’t tell her really where we were going or what we were doing, but (as the hospital advised) we only mentioned something the night before. At dinner and then again at bedtime we told her that we’d be waking her up early and that we’d be leaving right away. There wouldn’t even be enough time to take off her diaper and put underwear on. (She’s potty trained during the day, but we figured we’d keep her in diapers through surgery and recovery, especially since she’d have an IV of fluids for 24 hours). Sometimes she has trouble waking up, so we wanted to prep her ahead of time as to what would happen when we woke her up. She was a champ and let us get her into the car without any problems. We made sure to eat something before she got up. She never mentioned breakfast or being hungry all morning. We reported at 6:30am and checked in at the surgical office where she got a hospital bracelet (and so did her monkeys!). We were then taken to a big room with several curtained off areas for each kid. There we changed her into little kid scrubs – so cute! There were quite a few children there and tons of nurses, doctors, anesthesiologists, etc. This is basically the holding area before they are taken into the ORs. Several people came to speak to us here and we were there probably about an hour? We had a nurse, an anesthesiologist, a child life specialist, a surgical nurse, our doctor, another anesthesiologist. The child life specialist showed M the mask and let her try it on and sniff it (there was something fruity smelling rubbed on the inside). M was a champ and just went along with what everyone said. One nurse got her a car and she played around in the car for quite some time. There are people walking all over the place, but they really don’t mind the kids roaming around and playing with the cars. They brought a gown and hat out for whichever parent would accompany her to the OR. We let her choose. We asked her, which one of us would you like to go with you to put you to sleep for your nap? She chose me. She was probably the youngest kid in the holding area except one little girl that looked to be about 12-18 months old who was there with just her mom. I saw them leave to back to the OR and then saw her mom coming back without her with tears in her eyes. That’s when it really started to hit me. When it was our turn one of the anesthesiologists brought an iPad with Tinkerbell and we all walked back to the OR. M rode in her car, but then go out and walked with them. She didn’t old my hand and probably would have followed them right in there without me – what a brave girl. They had her sit on the side of the bed and I sat on a stool facing her. They put the iPad right next to her and she watched that while they put the mask on her face (she was sitting up) and they said she should sniff the fairy dust. She took a few breaths. They had warned me she might have some muscle spasms and I think they thought she would at this point. I think she had one little one, then looked kind of like she might vomit and then she snored, so I knew she was out. I told her I loved her a bunch and then the child life specialist walked me back to Ryan. Since I’m still nursing S, I had to be sure I brought my pump to the hospital. I decided to pump just after M went under so that I could be ready and available for her for several hours after the surgery. We were told the surgery would be about 50 minutes, but now that I am thinking about it, I wonder if I heard them wrong – maybe they said 15?! By the time I pumped and ate half a sandwich the surgeon was standing in the waiting room calling our name. On a side note, they recommended we pack food to eat in the waiting room during the surgery, as we couldn’t eat much before and would be with her in recovery for a while afterwards. So, their was the doctor, standing there, before I even really had a chance to worry. I thought – oh no – they got in there and either couldn’t do the surgery, or something went really really wrong. And of course then he says, can you come with me to this little private room? Come on!!! Just give me a thumbs up or something! But as soon as we get in the room he says everything went great, he just can’t say anything in the waiting room because of HIPPA. He tells us everything went very well and sure enough her adenoids were huge too. He tells us they are getting her setup in recovery and as soon as she’s situated they will come get us. We’d been prepared that she might wake up very upset. I was really prepared for the worst. Sometimes at home she wakes up really upset and spends what feels like 20 minutes crying in her room. She’ll refuse to let anyone touch her. I thought this might be like that. When they took us back she was asleep on her stomach. I think she must have heard us because she opened her eyes and started crying a little bit. After a little maneuvering around the IV we were able to get her out of the bed and onto my lap. She stayed there until the room was ready for us – half hour to an hour maybe? At one point she woke up some more and started crying again so they gave her a little morphine. She was upset, but not flailing or crying hard like I thought she might be. She snuggled up to me and fell back asleep. Then they got me into a wheel chair with her still on my lap and got us into our room. Then I got into bed with her on my stomach and we stayed like that for a while. They warned us that her breath would be stinky from the anesthesia and it sure was! I had also heard that she might have a red face from some of the medication she got during surgery. My parents came to visit about 11 am or so and she woke up red, hot and upset. I guess a fever up to 101 is also ok and not uncommon. I called the nurse in but her temperature was fine. They said she could also get hot flashes. I think she had a few of those during the morning as she was due for more medication and got uncomfortable. She was upset, but never as bad as I thought it might be and she never complained of her throat hurting. She got gradually better as the day went on. They alternate between a prescription at has Tylenol and a narcotic (hydrocodone) and Motrin. Each can be taken every six hours and can be taken together. So basically she’s getting some medicine every 3 hours. You would think the narcotic would make her sleepy and groggy, but it really amped her up and made her silly and talkative. We spent the afternoon walking around the surgery recovery floor, in the playroom, hanging in her room and reading books. We did not push for a nap and she did not fall asleep. She did a great job eating and drinking. The hospital had a slushy machine right on the floor and she ate those up! She was a little bit interested in the IV, but overall didn’t pay it much attention. They had it taped down of course and then wrapped up in a washcloth. 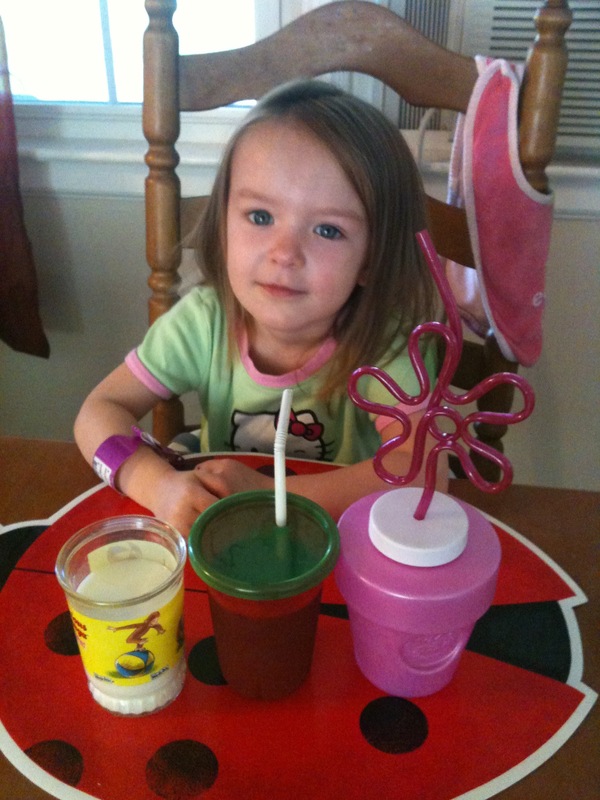 They told her it was her special straw giving her a drink. She started saying, this is my medicine for my boo-boos. When you asked her where her boo-boos were she’d point to her scrapped knees. If it wasn’t for her voice being high and scratchy you’d probably never realize that her throat had been operated on. We decided that Ryan would spend the night with M and I would go home to take care of S. I left the hospital around 8pm as they were settling into bed together. He ended up staying in her bed until she fell asleep and then he slept on the big couch in the room which doubles nicely as a bed. 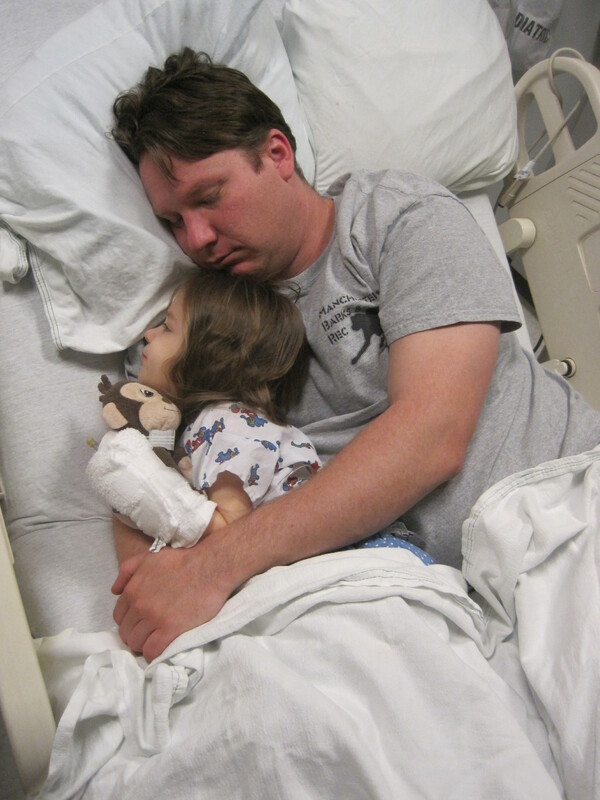 Her bad was a normal size hospital bed, but there were bumpers that we added to it at night. S was asleep when I got home and slept all night until 5am (thank you!). I was back to the hospital by 7am. We had breakfast and hung out a little bit before heading home at about 9:30am. Our first day and night home went really well. She continued to eat and drink just fine (maybe even better than before!?). She painted at her easel outside and really wanted to go on her slide, but we wouldn’t let her. After naptime she had a tough time waking up and she ended up spending the rest of the afternoon watching Steve Songs and relaxing on the couch. I slept in her room last night and woke up in time to get her her medicine (3 times) before she woke up in pain. She didn’t even snore! She seems great so far today, relaxing on the couch, painting and drawing with crayons. So far so good! We’re told the different voice could last 3-4 weeks. One of the “side effects” was that her voice could stay like this forever. Guess we’ll see. Here’s a video. And here she is staying hydrated today! My 2 year old is going in to have her adenoids and tonsils removed in six days. I am scared to death. This helps. Thank you. Hang in there. It’s a tough recovery but all will be better in the long run. Hi. 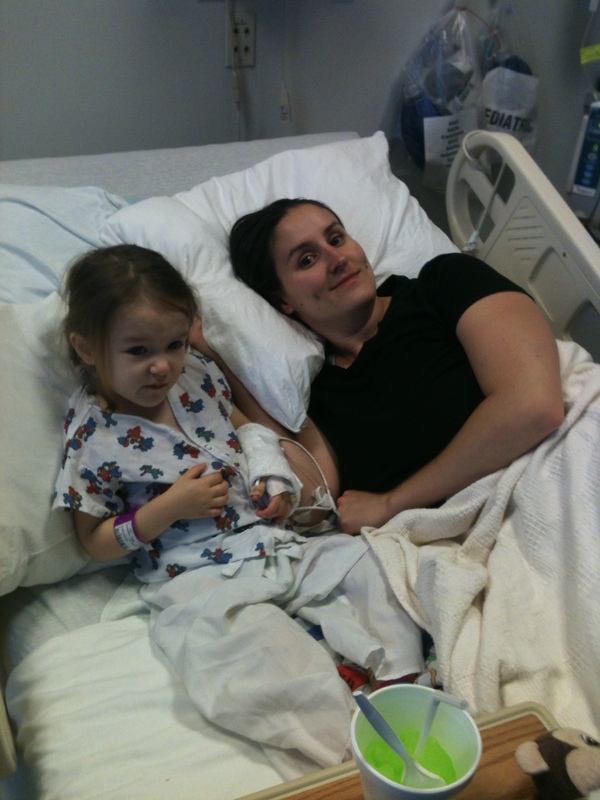 What was the reason your daughter got adenoidectomy? My daughter has had 6 ear infections this year and has sleep apnea. She got evaluated by an ENT and suggested getting her adenoid removed. She didn’t have excessive infections, but she had lots of sleep apnea and snoring. She also had what they call “darth radar” breathing. This is so helpful, thank you very much for taking time and letting us know details. Can you please comment on how long the total recovery time was? It was over two weeks and probably almost 3-4 weeks until she was back to normal. Thanks a ton for posting your experience. This is really helpful. We are scheduled to get my daughters tonsills & adenoids removed next week. I’m soooo nervous! My daughter also doesn’t have lot of ear infections or strep. But does get swollen lymph nodes often and snores. Also she seems stuffy all the time. What improvements did u see in your daughter after the surgery? I’m trying to convince myself that the surgery is absolutely necessary. Your response would really help. Thank you. We saw the snoring go away right away and her sleeping improved greatly. It was a terrible recovery and we questioned our decision daily, but in the long run it was the right decision. We didn’t have any issue with swollen lymph nodes or infections leading up to surgery, just the snoring and sleep apnea. Our younger daughter also has huge tonsils and every dr that sees her remarks about them. However, she doesn’t snore, so we’re not worrying about it just yet. Hey thanks for this! My 4 yr old is having tonsils, adenoids and tube in ears. I’m so nervous for her. Thanks for sharing your story. Good luck! As my daughter gets older, I am wondering if she doesn’t have a very good tolerance for pain and that’s why it was so bad! Hang in there – hopefully he will be feeling better soon! Delores, my 4 year old son is having the same procedure done June 1st. How did your child do? It will be a tough recovery, but you’ve got this! Thank you very much for sharing your experience. I have heard of having extremely bad foul breath from the incision site not from anesthesia. Was this your experience? Yes, like absolute death. Roadkill in the mouth – yuck!